Whether you like action or prefer peace and quiet, you will feel welcome in Blekinge. Here you can enjoy great music, the city pulse, learn more about our history and technology as well as just relax by a quiet lake and listen to the birds. 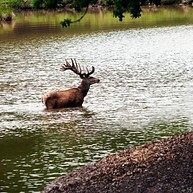 You can experience our wild animals up close or maybe visit the more exotic ones at a distance. You can bath and play in waterparks or take a boat trip in our beautiful archipelago. Your imagination sets the limits! The gateway to Eriksberg opens onto a world of experiences packed with everything from wild animals to gastronomic treats. Its a feeling of an african lodge in Swedish settings. Eriksberg is just not a wildlife safari experience. Many guests are sure to be surprised when they encounter art, exhibitions and historical tours. There is also playland for Children and a café. However, Eriksberg are best-known for hunting and fishing packages and, perhaps most of all, for the food - locally produced vension and boar meat is served at the two restarurants Visenten and Havsörnen exclusively placed at the secluded propery estate. At Eriksberg you will find truly extraordinary accommodation, with the nature right outside. An experience you should not miss visiting Blekinge. Visit one of Kulturcentrum Ronneby's many exhibitions, perfect for art fans! 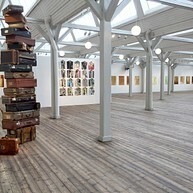 With an exhibition area of 1500 square metres, Kulturcentrum Ronneby is one of the largest art galleries in southern Sweden. The gallery is also used as a music venue, theatre and other cultural events. The building was built in 1907 and was then used as a warehouse for Kockums Emaljerverk (enamel works). 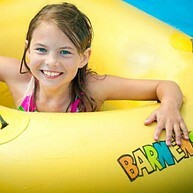 Do you like swimming, going on water slides, playing and climbing, and enjoying farm life? If you do, you will have a really great day out at Barnens Gård. You can do all of these things here. And you can also drive an electric car! Barnens Gård a lesiure park, a water park, animals, cafes and restaurants, as well as many activities that children of all ages will enjoy. HMS Neptun - a real submarine! What is it like to be on board a real submarine? What does it smell and sound like in a vessel that has conquered the depths of the oecan? Life on a submarine is mysterious, but now you can experience what it is like at the new exhibition at the Naval Museum in Karlskrona. 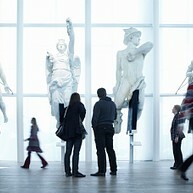 There is also museum highlights, great lunch deals and lots of fun for the whole family. Did you know that there also is an underwater tunnel? Come and explore! Karlskrona is included in the World Heritage list. It is the best preserved and most complete naval city that remains from the 16th and 17th centuries. It is an incredible experience, seeing som much history in everything from the battalions and fortifications to the bridges and churches. There is the Rope Walk of Lindholmen, Trossö, Drottningskär Citadel and Kungsholmens Fortress. Take a guided tour. The Visitor's Centre in the summer is the Church of the Holy Trinity at Stortorget. Tjärö is a pearl in the Blekinge archipelago with meadows, grazing cattle, stoneware and lush hiking trails. The beautiful island is a nature reserve - also good for swimming and canoeing. Enjoy the floating sauna or why not jump in the ocean from the death cliff? There is a jetty with café and restaurant. Take the boat from Järnavik or Karlshamns inner harbour. It's also possible to spend the night here. At Tjärö there are double rooms, multi-bed rooms or you can rent your own cabin by the sea. The accommodation is in the 17th and 19th century with charming red cottages and white knots. All the houses are idyllically located in a small town in the middle of the island. There are also rooms for 1 to 6 people. Along the coast, the archipelago turns into sandy beaches by the time you reach the western corner of the county. Instead of an archipelago it has beaches - many long ones with beautiful fine sand. In Sölvesborg there is a beach for every day of the week, and even more. Some of them are full of life and have many visitors, with kiosks, restaurants, and playgrounds next to them, while others are quiet and hidden. 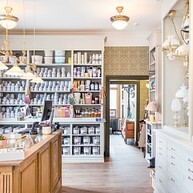 Karlskrona Byggnadsvård & Inredning is Blekinge's most well-known building conservation shop, located in Karlskrona Lamp factory's old premises from 1899. In addition to a wide range of linseed paint, wallpaper, fittings, lighting and everything else that includes traditional building care, it also sell interior decorations and gift items of varying sizes. The producers are mostly local- everything exclusively from Sweden and Europe. Also, the shop offers all the varieties from the old traditional well known Karlskrona Lamp factory who is still manufaturing next door. A beautiful, award winning park and a living cultural reserve. The park in itself feels like a health cure. There are alot of acitivities throughout the whole year; the charming Café Mandeltårtan, a flea market, music events and festivals. 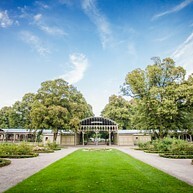 In the 1870s a spring in the park became very popular to drink from, and people from the whole country started travelling to Ronneby Brunnspark to drick from the spring as a way to improve their health. Still today, visitors come to Ronneby Brunspark for the same reason; to feel good. 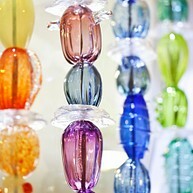 Glassworks, gallery and shop. The glass artist Malin Mena makes and blows her own glass. You find her studio in Nättraby in the Glass Tower, which is Nättraby's old water tower. Here you can try to blow your own glass and hear Malin speak about her passion for glass. 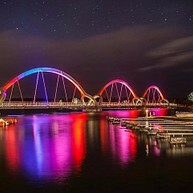 Sölvesborg Bridge is the longest pedestrian and bicycle bridge in Europe. It's 760 meters long and has a spectacular design and lighting. Via the bridge you can reach two small islands that you can explore. The bridge connects the centre of Sölvesborg with Listerlandet. At the end of the bridge, there is a golf course and a paddle court. There are also bike paths Sölvesborg's sandy beaches and the lovely harbor of Hällevik. At the beautiful east coast in Blekinge, between Kristianopel and Torhamn, this adward winning goat and cow cheese farm is situated. It is a small and genuine cheese craft with farm dairy. Orranäs Farm Dairy manufacture cheese from goat and cow's milk. They have the goats them selves on the farm and the cow's milk is bought from a nearby organic farm. Come visit the farm and shop. Have a stroll down to the sea and if you are lucky meet the free range goats. The collected memories and traces of the history of mankind in Blekinge from the past 10 000 years are amassed here for us and for future generations. You'll also find temporary exhibits. Are you more excited about being outside then go to the museum's playground, Grevagrundet, in the archipelago's sign. Here, both children and parents are joyfull. Guided kayak tours, rent or buy your own kayak or get the best knowledge about kayaking in Blekinge archipelago. 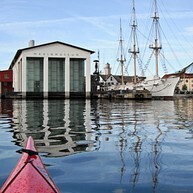 Karlskrona kayak offers everything you need to experience a beautiful tour. The rental place is situated in the center of Karlskrona, next to Fiskartorget and Scandic Hotel. 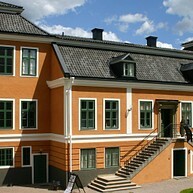 Kulturkompaniet offers different historical tours all over Karlskrona. They will guide you to different fortifications or to discover new parts of Karlskrona that you never thought existed. One of their most famous tours is "If the Russians came" a city walk "underground" in central Karlskrona. One of the mountain ranges visited is a 1950´s shelter with seating for 6,000 people. Do you dare? A unique spot in Kalrskrona archipelago! Utklippan is Sweden`s south-easternmost archipelago with a nature reserve and a big seal colony southeast of Karlskrona. It`s devided in Norraskär and Södraskär. The harbour is located on Norraskär with berths alongside. On Södraskär you find a hostel and an old lighthouse. 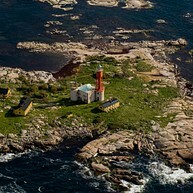 At Utklippan you can dive with seals, enjoy the wonderful nature or visit the old lighthouse from 1840.